There are likely hundreds or even thousands of calculators on the internet and I’ve searched many of the most popular ones and found one that I like the most, which actually happened to be run by the Australian government and their Securities and Investment Commission. Go the their site or use any other one you like as well and play around with the numbers and amount you can save and the number of years to see how the numbers shake out. One word of caution, when it asks you for compounding frequency, you’ll almost always pick “annual” when dealing with savings/investments. I wish savings compounded monthly, but that is reserved for consumer debt items instead (which is the bad side of compound interest). I tried to use the SEC compound interest calculator the US government has, but it really never worked right all the times I tried it. Oh well, Australia seems to have their act together on this one, so give it a go, mate! 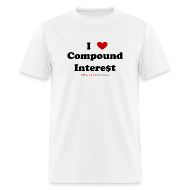 Determine how much your money can grow using the power of compound interest. You can also calculate how much money you need to contribute each month in order to arrive at a specific savings goal.